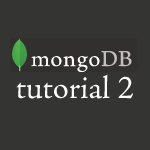 In this part of my MongoDB tutorial I cover insert, understanding id keys, find, update, remove, drop, searching for ranges, and numerous ways to query your database. If you haven’t watched part 1 definitely watch it first because I showed how to set up everything in that tutorial. Like always, all of the code follows the video below. It is best to have it in front of you as you watch so that you can refer to the documents stored in the database.